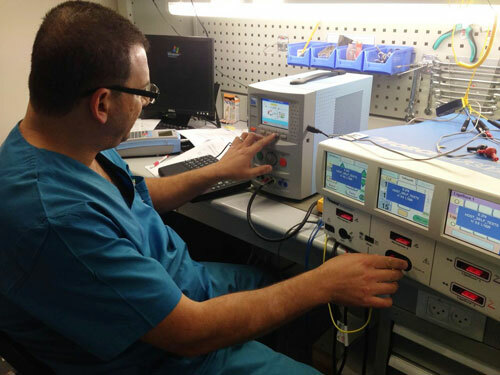 One of the largest hospitals in Israel has specified Rigel Medical’s range of advanced testers and analysers to improve the testing and calibration of biomedical devices. The move by the private Herzliya Medical Center (HMC) has simplified testing procedures as part of an in-service planned preventative maintenance programme overseen by the Biomedical Department. The Rigel 288 automated safety analyser, electrosurgical generator calibrator Uni-Therm, Uni-Pulse defibrillator analyser, Multi-Flo infusion pump analyser and combination vital sign simulator UNI-SIM are among the Rigel Medical products the hospital’s started to uses and help to improve compliance with appropriate standards including IEC 62353 IEC/EN60601-1, VDE 0751-1, AS/NZS 3551, AAMI, NFPA-99, MDA DB 9801-2006. He cites one example of how impressed he was by Rigel’s technology. “We set-up a customised auto-test sequence using the Rigel Uni-Therm to check an ESU and ran through all the manufacturer’s recommended tests in under 10 minutes. Using the Rigel 288 has also made IEC 62353 testing far less complicated and much easier, said Tamim Jaber. “The user-friendly screen on the 288 displays a very simple step-by-step test diagram which is very easy to understand and follow to check measurements such as earth bond and applied parts leakage,” he said. The incorporation of Bluetooth connectivity also makes it quick and easy to download test results and data to Med-eBase, the easy-to-use Rigel Medical asset management software software. This enables the Biomedical Department to store and manage test results, email html test certificates and schedule new work orders and maintenance or upload further data to such as the EUT Asset details and global sequences to the testers. Tamim Jaber added that the technical support and advice available from Rigel Medical and its local distributor MedLife was also an important factor in deciding to opt for its products. The Uni-Therm, the easiest way to test all leading electrosurgical devices, the compact UNI-PULSE defibrillator analyser and UNI-SIM, which is capable of undertaking six synchronised vital signs parameter tests simultaneously all form part of a comprehensive range of high performance specialist biomedical test equipment supplied by Rigel Medical, part of the Seaward Group. Rigel Medical is based at Bracken Hill, South West Industrial Estate, Peterlee, County Durham, SR8 2SW. For more information, including pricing, contact info@rigelmedical.com or call the Rigel team on +44 191 5878701.